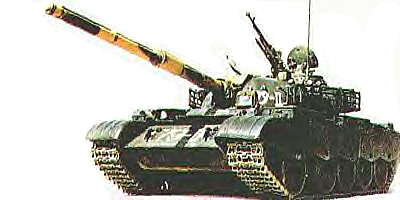 The Type 69/79 was merely a Type 59 (Based on the T-54A) updated with captured T-62 technologies, obtained during the Sino-Soviet split and border war of 1969. However, the Type 69 failed to meet the Chinese PLA main requirements and most of the tanks of both series were largely exported. There was still the need for a domestic design that can help to keep pace both with Western and Soviet technological advances. The army requested a true second generation MBT, that would be designed and built by 617 Factory, renamed later the First Inner Mongolia Machinery Factory, and then NORINCO (China’s North Industries Group Corporation). The Type 80 was a real departure from the Type 79, was mass-produced to around 3000 units, and was followed by the enhanced Type 85 and Type 88, produced to fewer numbers but helping pioneering 3rd generation features. 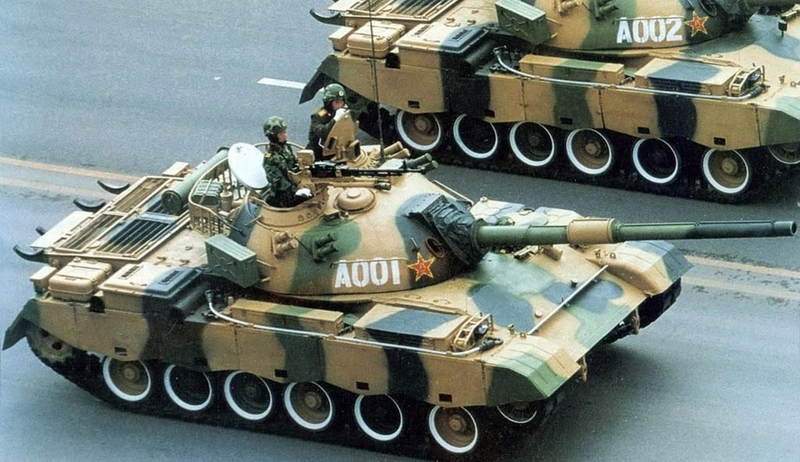 Although neither of the three types was kept in use after 2005 (kept in the army reserve) they represented a great deal a cold war technological advance for the Chinese People’s Liberation Army in the design of main battle tanks, paving the way for today’s Chinese standard MBTs of the Type 90/96/98/99. Type 79 – credits: wikipedia. 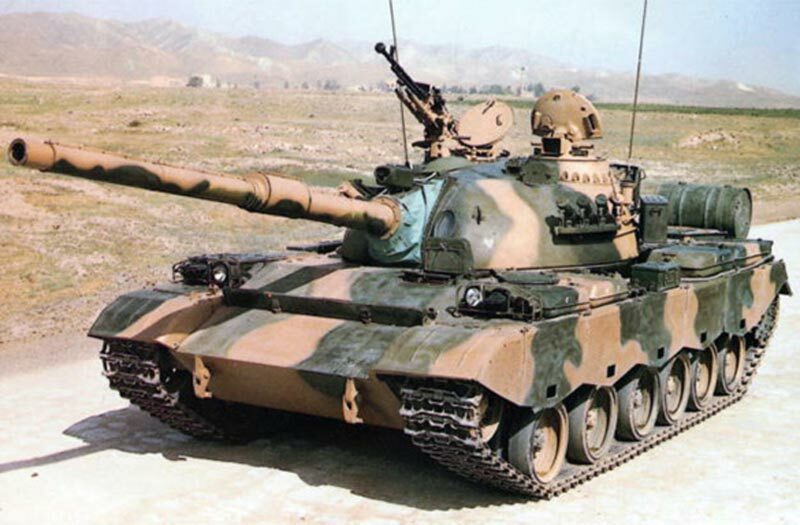 The Type 80 largely take features from this export version, but introduced a brand new chassis and powerplant. Even today, distinguish between the Type 80 and 88 is not easy. The Type 85 at least sport a brand new welded turret, but the others had the same cast turret also used by the Type 59, 69 and 79. Their chassis is also very similar, with a characteristic six-double rubberized roadwheels, German licence-built diesel, and NATO’s 105 mm rifled gun, a copy of the Austrian version. This chassis was lengthened, at 6.37 m hull only vs 6.24 m, the rear being elongated to make room for the German-licensed diesel. The hull is still assembled with welded RHA cold steel plates, with the characteristic glacis that looks identical to the one seen on the Type 59/69. The compartimentation is straightforward, with a front driver’s compartment (located on the left hand side) with his set of three periscopes (the central one can be swapped for an night vision device), and a small hatch opening to the rear. He also have a small escape hatch behind his seat. A welded breakwater is welded on the front glacis, to deflect running water when crossing rivers from the driver’s sights and hatch. On each side were placed a set of day and blackout headlights with armored covers. Another important characteristic is the engine exhaust which are replaced at on the other side. Engine deck louvres and grilles are also modified due to a different disposition of the German origin diesel. Protection is classified, but thickness seemed to have been relatively similar to the Type 69/79. However side protection is enhanced by the fitting of thick rubber side skirts, in six panels, to deflect RPGs and other hand-held weapons. Due to the absence of side exhaust and longer catwalk, up to five storage boxes can be carried, most of the rounded type. Type 80 – credits: wikipedia. The most striking difference of the Type 80 and following with the previous serie in unmistakably their brand new wheeltrain. Chinese engineers and in particular Fang Weixian (方慰先) of the First Inner Mongolia Machinery Factory seemed to have studied well the European wheeltrains and suspensions, which procured a much smoothier rides than the primitive five large roadwheels of the Russian models, that were essentially a WW2 design initiated for simplification and mass-production but procured a much rougher ride. A design of new much smaller roadwheels, doubled with the track’s central pin traveling in between, was chosen. Each of these (apparently made in cast steel) were rubber-cladded. They seemed to have been placed evenly and each were equipped by brand new sets of torsion bars units and shock absorbers placed at the front and rear units. The drive sprockets are still placed at the rear and apparently identical to all previous models, but the front idler seems to have been of a new model. The tracks were also of a modified model. Anther gain procured by the new wheeltrain was it allowed the hull to be lower above the ground due to the smaller diameter of the roadwheels. Thanks to this the profile was somewhat reduced, like contemporary soviet tanks like the T-64 and T-72. The powerplant was a modern 12150L-7BV diesel 730 hp (544 kW) which compared well with the old Chinese diesel 580 hp of Soviet origin. This added power helped the tank to obtained better performances despite having a heavier hull (38 tons vs 36.7 tons). Power-to-weight ratio was indeed 19 hp/tonne, compared to 15.8 hp/tonne for the Type 69/79 and previous models. The engine was coupled with Mechanical, planetary transmission. Top speed (on road) was now 55 kph, 5 kph faster than the Type 69/79, with an extended range of 430 km to 600 km thanks to external drum-type fuel tanks attached at the rear. Field performances were as follows: Climbing a 60% Gradient or a 0.8 m vertical obstacle, crossing a 2,70 m trench, and ford 1.40 m of water without preparation. With full preparation it is believed it can cross at the practical depth of three meters. The snorkel was usually fitted on the turret’s rear storage basket. Muzzle velocities and penetration values are unknown for the others rounds but can be close to the regular NATO German licence-built L7 data. The turret design is still similar to the previous series, with a cast construction, featuring the same varied thickness characteristic of the type, with a “horn” shaped cross-section, thickest at the base, and thinner when going the roof. The hull seen from above have the typical pear shape of the previous models, with the “pig snout” main gun mantlet, covered by a tarpaulin, the gunner’s sight on the left, then the main commander day/night sight (main specifications and magnification range unknown), right before his fully rotatable cupola, bolted on the roof and comprising six vision blocks. The loader’s single piece rounded hatch is rear-opening while the commander’s one is front opening. Storage can be seen depending of the version, with various fittings at the rear of the turret. In later versions, a large running storage basket in installed all along the turret, practically up to the front section. Active protection is enhanced by the presence of two banks of four electrically operated smoke dischargers (or four banks of two), firing smoke rounds. In addition there is a smoke screen generator device, injecting diesel fuel into the exhaust. Fire accuracy is much improved on the type 80 and following models, thanks to an improved gun stabilization system, the Type 37A dual-axis stabilized light spot fire control system (FCS). That means that both the gunner’s sight and main gun are fully stabilized, allowing for the first time improved fire-on-the-move capabilities against other moving targets, with much increased first hit capability. This little known experimental variant used a new light spot fire control, external laser rangefinder, storage racks surrounding the turret’s rear. Apparently it did not led to any production. It was apparently blended with the -II variant. Type 80 – credits: unknown. This variant was developed in the same time-frame and capabilities as the Type 85. It is improved in several directions. First, there is an external laser rangefinder licensed from UK and integrated with the Fire control system primary sight. The laser range finder mounted over the gun’s base is external and therefore vulnerable. This feature will be improved on other models. Second, there is a Built-In-Test (BIT) system to rapidly identify malfunctions. Third, crew protection is enhanced by a full internal NBC lining and an over-pressure system. This is therefore a collective NBC protection, allowing that crew to not need to wear individual NBC protection gear inside the tank anymore. Four, a lens protection system is added for sights. Five, the turret is now surrounded by storage racks which also can act as extra protection against HEAT rounds. Armour mods are also added to the front of the turret and apparently some automotive enhancements. This model never entered production. 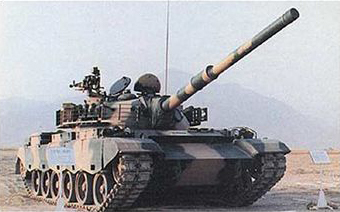 The improved version of the Type 80 which entered service in 1988 under the “Type 88” PLA designation. More than the former, it integrates a large amount of Western technologies. 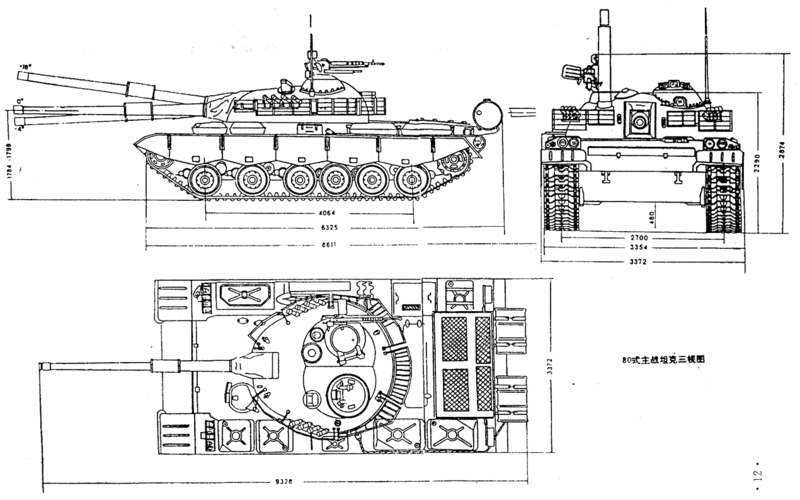 The design is similar to the Type 80-II, to the extent of the front storage racks removed to fit a set of explosive reactive armour (ERA) bricks. Production of Type 88-series MBTs was stopped in 1995 but about 400 to 500 Type 88/A/B are are in service with the PLA today. Is main features remains largely identical to the Type 80, still relying on the same small road wheels, suspensions, rubber skirts, and liquid cooled, turbocharged 730 hp 12150L-7BW diesel engine for mobility. The 105 mm rifled gun had an elevation/depression of 18/-4.5° and is assisted by a laser rangefinder (now internal, coupled with the main sight and fire-control system. This gun can which can fire all NATO rounds, and in test showed it can defeat 200 mm vs APFSDS and 300 mm vs HEAT. It has an auto-loader which gives it a maximum rate of fire of 7 rounds a minute and reduced the crew to three. 48 rounds are carried. Auxiliary armament still includes the 7.62 mm coaxial GMPG and a 12.7 mm Type 59 AA heavy machine gun which could be served by the commander and loader. The type 37A fire control system is also shared by the Type 80 and includes a dual-axis stabilized optical sight, light spot FCS, a ballistic computer and an internal laser rangefinder. The wheeltrain is protected against hand-held RPGs by rubber hull skirts (same model as before). The cast turret (last model to feature this 1950s feature) is surrounded by storage racks which both allows extra room for spare parts and crew gear, but also provide additional protections against HEAT projectiles since the shape of the cage is reminiscent of the BAR armour. These are removed on later models in favor of reactive armour plating. For active protection two banks of four 81 mm electrically-firing smoke grenade launchers are still present on each side of the turret. The device to produce additional smoke by injecting diesel fuel in to the engine’s exhaust is also kept. Type 88s in a parade through Beijing. Improved variant with a completely redesigned breech loading system to fire the new 105 mm ammunitions, at even greater rate of fire of 13 rpm. The early light spot FCS is replaced by an image-stabilized JSFCS-212 integrated FCS. Modified Type 83-I 105 mm rifled gun (also called the “long” version) with a longer barrel, and improved thermal sleeve, which has better performances. It can fire APFSDS, HEAT, and HEAT-FRAG. Protection is enhanced by the addition of the FY series of double explosive reactive armour, proven against APFSDS and HEAT-FRAG rounds. – More than 230 Type 88B were purchased by Myanmar (Burma), seeing action recently in the civil war in northern Myanmar. About the use of DU rounds for APFSDS-T by China. Armour : RHA classified, BAR (II), Rubber side skirts. Total production Around 3500 (3000 + 500 estimated). A Type 79 MBT for comparison. Early Type 80 MBT, without side skirts to show the drive-train. There is a gap between the second roadwheels and the four rear ones. Type 80 in a parade in the early 1980s. Type 80 with the standard three-tone camouflage (dark sand, olive green, dark grey). Type 80B at the National day parade. Type 80 with a three-tone camouflage (two tones of green).